We are here to help students train their bodies and minds at their individual pace to the best of their ability. At Rotterdam Martial Arts, we believe it is our purpose to help each student attain their personal goals. Through the practice of our 5 tenets, our students learn some of the values it takes to become leaders and valuable members of their community. Every student is motivated by different goals, each unique to them. We receive great satisfaction watching our student achieve levels they never thought possible, watching them execute techniques that they never thought they could, and seeing their fitness level increase each time they come to class. Our motivation is watching our students grow as martial artists, but more importantly, as people. We employ a belt ranking system within our school as a way to allow our students a tangible method of judging their progress. Beginning students start as white belts and, with time and effort, advance through our belt system. 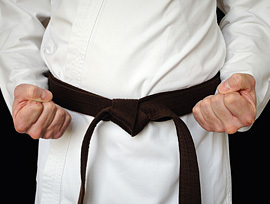 As the students work toward each new belt, their responsibility is to learn the new techniques and forms of that belt. This is one of the ways that we help our students to become accountable for themselves. Students are tasked with practicing the new techniques taught in class on their own and know that without the hard work in class and at home, they will not receive the reward of a new belt. Our fifth and most important tenet, Indomitable Spirit, is the belief that the student must first believe that they can achieve the objective they desire. As our students continue in class, their confidence grows as they reach each new rank. The growing belief in themselves is one of our goals for all of our students. We want them to have the confidence in themselves not to be afraid to pursue their own dreams. Helps the lungs operate more efficiently. Enlarges the blood vessels, making them more pliable and reducing the resistance to blood flow, thus lowering the diastolic blood pressures. Increases the blood supply, especially red blood cells and hemoglobin. Makes the body tissue healthier by supplying it with more oxygen. Conditions the heart, providing more reserve for emergencies. Promotes better sleep and relaxation. Dynamic energy-the ability to throw oneself into performance with vigor. Ability to change direction of movement. Ability to move the body quickly from one place in space to another. Flexibility of joints, muscles and ligaments. Concentration –the ability to avoid distraction. Understanding the mechanics and techniques of body movements.